The air is cool and the beauty of being in a house instead of a hotel room while traveling is that I can get up and work without disturbing anyone. Our friends arrived (after traveling the long way from Houston ) a few days ago and after being on the road for a week they were thrilled to have a comfy bed and a hot shower. It's been a whirlwind of events and I guess you are a bit sick of "Views of San Miguel" hence no blog. On Saturday we visited a city called "Hidalgo"
There are dozens of potters’ workshops making and selling talavera—Mexican hand-painted pottery and tiles. 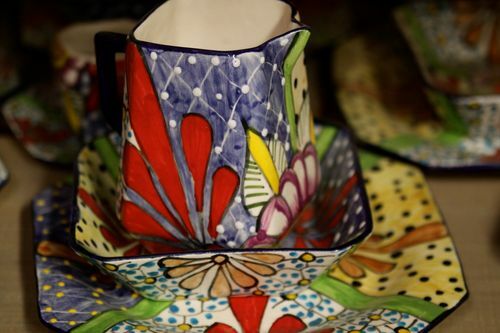 You'll find everything from cups and saucers, to giant urns, bathroom sinks, and floor tiles in countless colorful traditional designs. This little pueblo is also where Mexico's national hero, Padre Miguel Hidalgo, cut loose "el grito" (the cry) setting the Mexican Revolution into motion and changing the course of Latin American history forever. 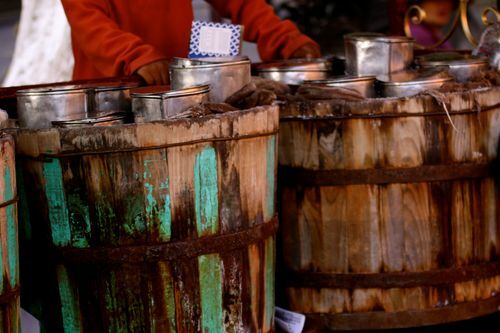 On a lighter note, it's also known for its unusually creative ice cream-making community. If you dare, seek out flavors like tequila, pecan, avocado, corn, shrimp, and even, brace yourself, pork rind and chili. Talking ablout pottery, you just can't stop the effect that the designs have on you, they subtly creep into your "creative" ideas. 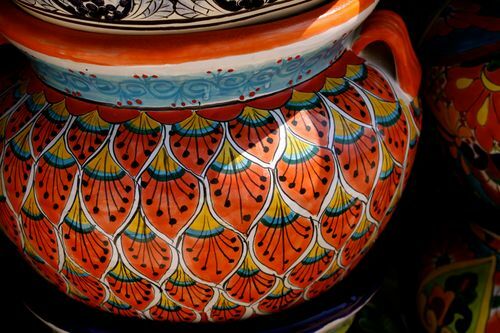 I love the pots below… the colors, the designs and the fact that they are all hand painted is exciting. 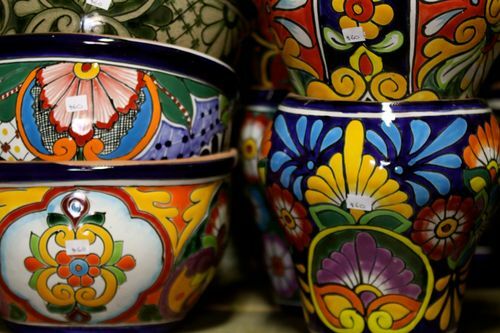 Between 1550 and 1570 a number of Spanish potters from the city of Talavera de la Reina arrived in Puebla Mexico. The blending of societies allowed the indigenous people to learn new techniques, and the combination of styles gave new life to Mexican earthenware. 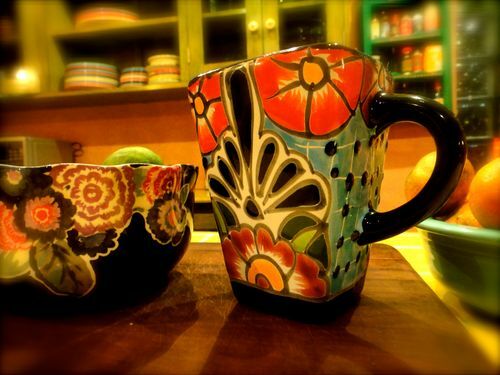 Poblano Talavera is the product of the fusion of these styles and influences. 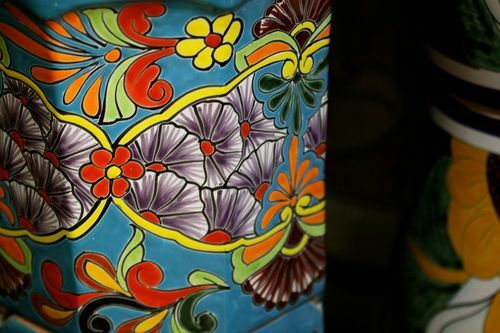 By the 18th century, talavera workshops began evolving into actual factories, resulting in a rapid and extensive distribution that reached almost every corner of Mexico. I've ordered a dinner set, 64 pieces and it will be made to my own design…. similar to this one. I'm doing some drawings to see if they can be incorporated into pottery too. It's not finished yet, but will be part of the journal quilt project and a quilt design. This is the scene as I walk down the street. and this is my morning coffee traveling cup, made in Hidalgo. I love the shape of your new dishes, Pam! What fun to be able to design your own. Hope we get to have a peek at the finished product. The tour around San Miguel has been wonderful. Your photos, as always, are eye candy. Thank you. Yummmm, tequila ice cream! I love the pottery and what a treat to be able to design your own. Are you having a place setting made for the grandies from the alphabet design? They are just stunning Pammy. I love the dinner set and having your own designs made, Wow. I can see it now “Homewares by Pam”. Thanks for all those great photos of Houston, just loved them. Well I can’t agree with everyone more! You give my eyes a treat with your beautiful photographs. I love the square cup!. As always many thanks for sharing your experiences and talents. oh, so enjoying this revisit to san miguel and hildago. and how totally cool that you’re having dishes made from your own designs…. Previous PostThe Houston Quilt Festival.